OK -- we're gonna say this right here, right now. Canadians are obsessed with the weather. Even more so than Brits, and that's saying something. Yup, the attendant highs and lows -- pertaining to all things meteorological -- are a hot (and, erm, cold) topic of conversation thanks to a climate that's just so, well, so darned unpredictable. Consider the evidence: Last year's late summer weather was nothing short of changeable. Escaped from the city and working as we were at the lake -- orchestrating a cottage reno' of almost biblical proportions -- there were times when we literally prayed for a period of calm respite. Four seasons in one day had nothing on us. So imagine the ensuing delight when our allotted timetable to build a sunroom looked like it might somehow align with a period of bright, sunny early fall weather. Sounds perfect huh? Glorious days for a porch installation: what could possibly go wrong? Issues climatic aside, let's look at why we actually aspired to an addition in the first place. 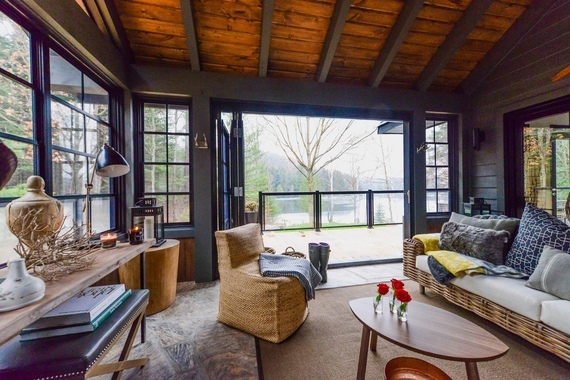 For us, it was a no brainer: adding a sunroom at the cottage is like adding maple syrup to bacon -- it just makes sense. Notionally, the addition of a bug proof screened porch provides a secondary living space to enjoy cool breezes in summer and shelter from spotty showers on drizzly days. And, God knows, we experienced plenty of the latter in cottage country. Never ones to do things by half, we elected to add a timber framed, pitched roof extension. 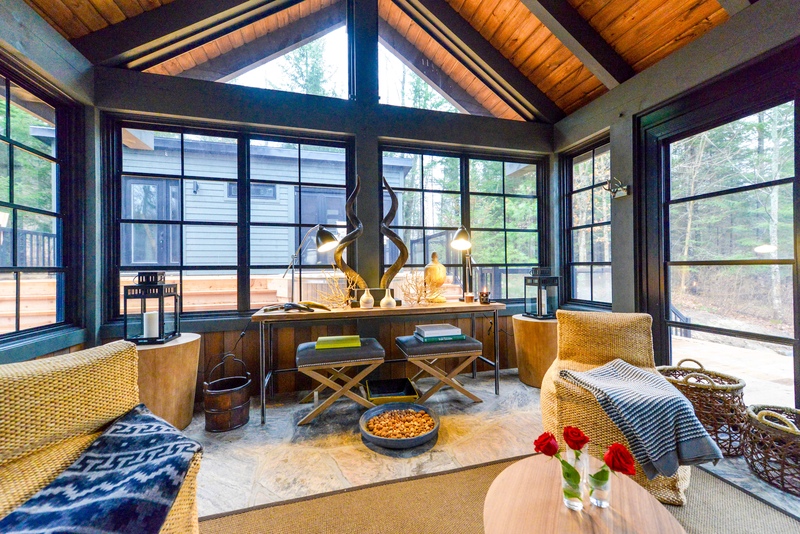 With auspicious planning and clever design it would, upon realization, be the ultimate sunroom. We positioned our 400 sq. ft. 'indoors/outdoors' dream room to the side of our main living space so we could enjoy a combined double living room / dining / kitchen configuration. The 'L' shape addition not only benefits from its position -- where breezes blow through -- it also changes the architecture of the 'A' frame, making the entire cabin feel significantly larger. Carefully appraising our ambition and analyzing initial drawings with Jodanne Aggett from the design department at Haliburton Timbermart (a fantastic resource for all things construction related -- visit their website) made life easy. Jodanne enjoys first hand knowledge of our area and, as we always say, 'local knowledge is power'. The talented draughts person has presided over many similar projects over the years and her experience allowed us to be cognizant of the attendant highs and lows of planning an extension. Jodanne's exacting skill set, in fact, made the planning process an absolute sinch. When she and we settled on size, ceiling pitch and so on, we submitted plans to the township for approval then drafted in the team from Discovery Dream Homes -- a celebrated builder with a stellar reputation -- to construct the most beautiful timber frame and roof. 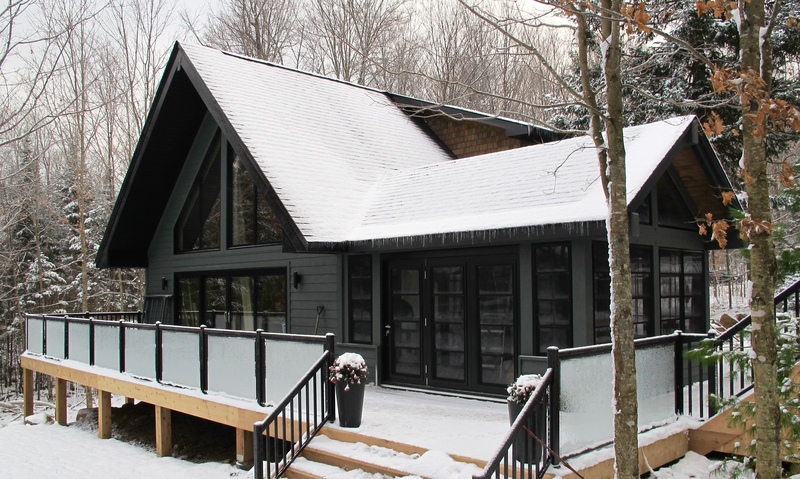 Grey painted Cape Cod siding was applied to the extension (to match the main house) and the results, we hope, speak for themselves. Continuity of finish makes the entire cottage seem so much larger, as our photography amply attests. So all good? Hmm. Not quite. Just as we were getting into our stride, it all started to go wrong. As we stood in front of the house surveying the careful install, we watched, dumbstruck, as our lovely team dealt with the onset of torrential rain. Holy crap: six weeks of unbelievably changeable weather had just begun. Being major fans of the Sunspace Weathermaster screened porch system we called the talented team at Nortech our local supplier/installer and asked them to pencil a site visit. The day they arrived, the mercury's vertiginous ascent was once again at full force (yup, after all that rain and cold) and the prospect of a windows and doors install looked like one that might go without further hitch. Imagine our lil' Scottish faces when Nortech suggested a prototype fold away door system. Wow! In a nutshell, the concertina portals meant bug screens to dodge entomological invasion and clear vinyl panels to keep the rain (and ahem the snow) at bay. PLUS the option to fold back the lake facing elevation (almost in its entirety) as and when required. Shopping for an amazing granite floor from Van Dyk Stone, black tubular wall lights from Home Depot (we used 'outdoors' products to be compliant with Code specifications) and furniture from Artemano (a favourite C&J store -- check out the Castlefield branch for inspiration or visit this site) got our design juices flowing. The comfy wicker framed sofa and the woven occasional chairs we chose really set the scene, huh? Nearing the finish line, we battled a path to Homesense and Ikea for a selection of gorgeous accessories which we displayed on a console fashioned using scaffolding planks and a $40 second hand classroom table from the local thrift store. The room almost complete, we set our date to finish in time for our Cabin Pressure 'reveal'. Confident we'd be able to enjoy the warmer tail end of fall whilst relaxing in our new sunroom -- we settled into the weekend and breathed a sigh of relief. And so it came to pass that, the film crew arriving on Monday, the Canadian weather decided to act up. Again. Yup, Mother Nature timed her first SNOWFALL of the year to perfectly coincide with our reveal. And we're not talking a few spotty flakes, we're talking several days of non-stop drama. Big fat juicy flakes that totally erased our summery backdrop. There was so much snow, in fact, we had to perform a decorative right angled turn. Yup, suddenly our sunroom (to make sense, for our TV show, of the unexpected white landscape) was transformed into a winter chalet. Jeesh: our reveal ended up looking more like Iceland than Ibiza. Aye, before long we were hanging skis on the wall and layering everything with faux fur and touchy-feely throws. But we love a challenge, and the unplanned aesthetic is cozy and appealing. And so began seven harsh months of snowy conditions. Aye, nearly 30 weeks of relentless, bitter chills. Which just goes to show that Canadian cottaging is, literally, super 'cool'. But now time for some sunshine. Please? Is it still called a sunroom if it's snowing?